This has been another productive week for me. 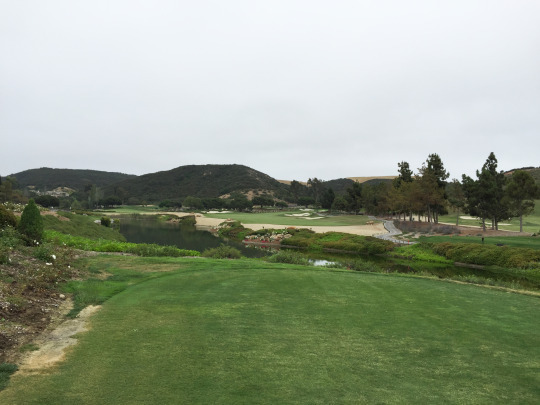 I knew I had two rounds at SoCal private clubs lined up, but ended up getting to play five in the course of two days! June is already off to a fantastic start. This is a round I’ve been waiting to play since early March. 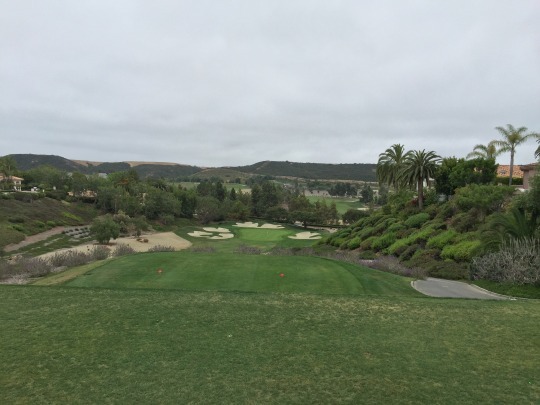 I had originally signed up for an SCGA outing here. However, really bad weather was in the forecast that day, so they had to postpone the outing. It was a relatively small group signed up, so rather than trying to pick another date or make us wait until next year’s event, they arranged for individual tee times. I know it’s been a lot of extra work for the organizer going back and forth between the club and the individual players, who all have different preferences. Then, there were people like me that weren’t attached to any other players in the group, so she was trying to pair up some singles. Luckily, I was flexible and so was another player, so we were ultimately set up with a 9:30 tee time on Wednesday morning. It was pretty quiet out here. There was a group of people getting ready to play when I arrived and they informed me that there was a Silver Seniors men’s club team play tournament going off ahead of us. They started as a shotgun on the first few holes. Otherwise, there weren’t many other members out that day. 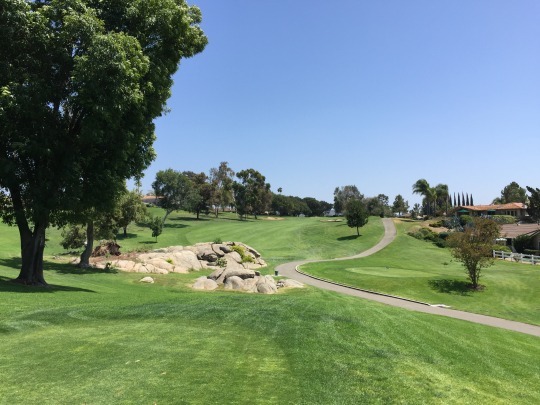 I met up with my playing partner and our forecaddie, Bob, who arranged for us to start on the back nine in order to avoid the men’s club group. We had no objections and off we went. 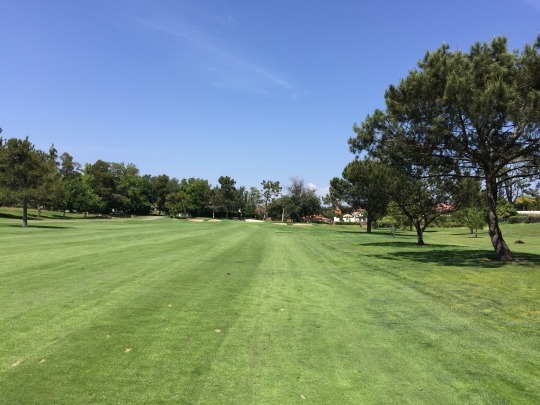 The only negative was that the 10th hole tee shot is very uncomfortable for a fade-hitter like me, so I had a tough start. Otherwise, it worked out beautifully as we never came across any other players all day. 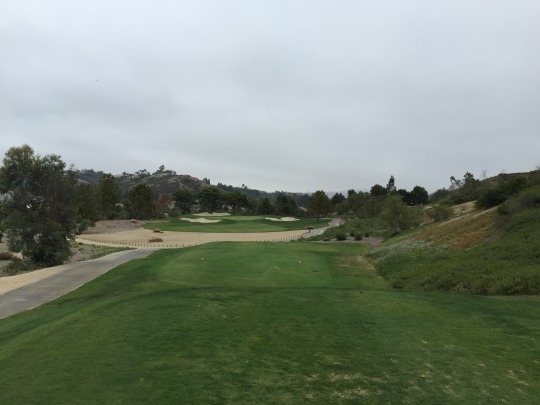 It felt like we had the course to ourselves for an ideal three-hour round. 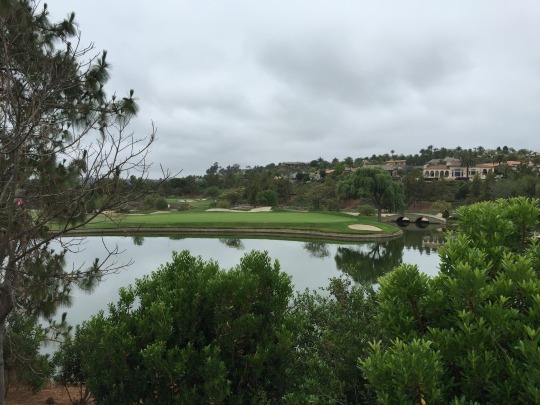 Del Mar represented the last of the vaunted Rancho Santa Fe circuit to me. 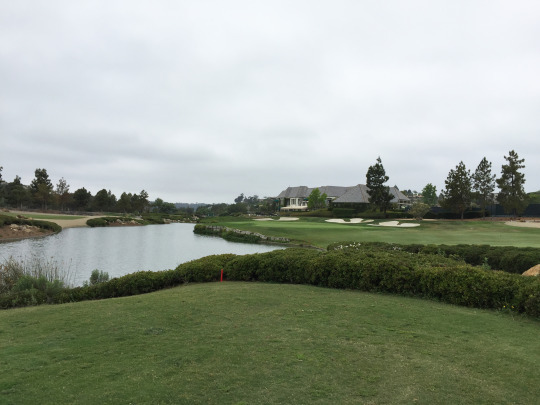 This town is loaded with equestrian centers and private golf clubs, so I feel fortunate to have played them all. 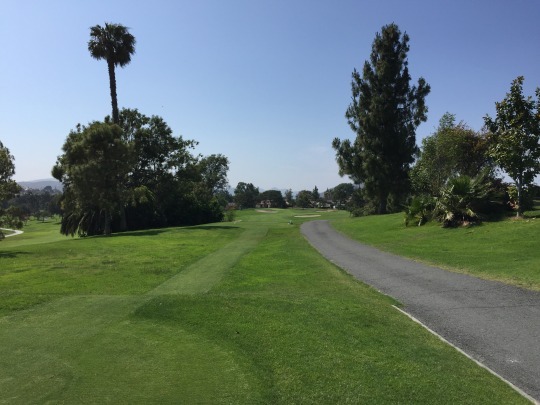 I do still need to play the little course in the Palacio Del Mar community, which I would probably group with this region. However, I’ve played everything else of significance. 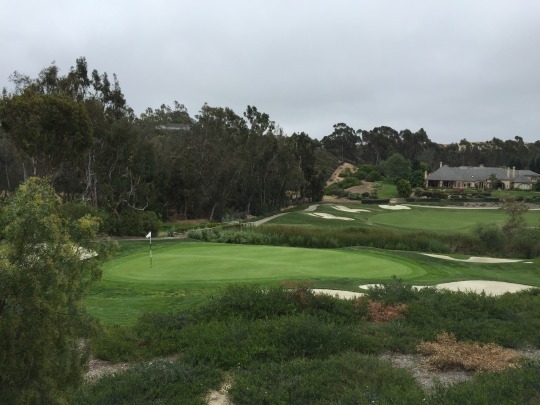 The course was designed by Joseph Lee, who maybe isn’t one of the biggest names in golf course architecture, but is pretty prolific. 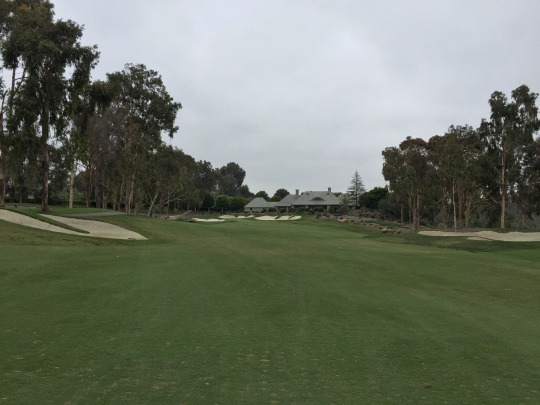 I had to look him up and found a lot of courses listed in the Southeast U.S., but his name was also attached to a few I had played including Cog Hill #2 and #4 (Illinois), Stonehenge (Tennessee), and both Omni La Costa courses in Carlsbad. 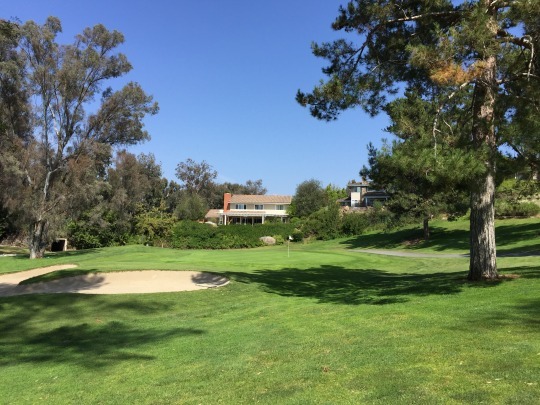 As I played Del Mar, I was actually reminded a lot of El Niguel Country Club in Orange County. It has a similar out and back routing on both nines and similar terrain, trees, hazards, etc. Del Mar is probably a little nicer and better overall in my opinion, though. 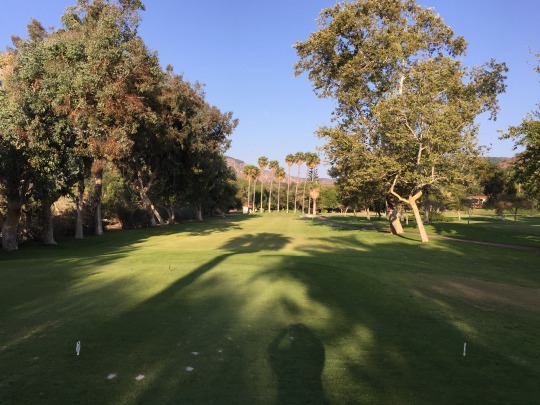 The little stretch of holes 10-12, where we started our round, featured the most changes in elevation on the course. The 11th is a really fun par-5 with a downhill approach and then the 12th is a nice par-3 with an elevated tee. 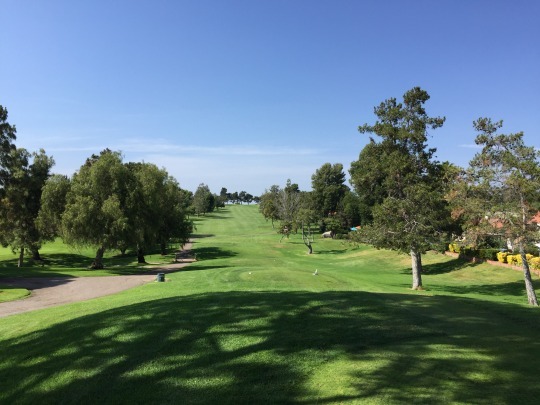 The rest of the course doesn’t really incorporate any significant changes in elevation, though there is a lot of natural undulation. It definitely never feels “flat” anywhere. 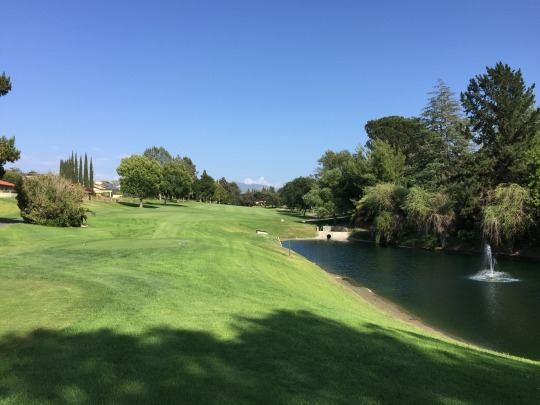 There are plenty of water hazards in play, some OB sections where homes line the course and an ample amount of well-placed trees, as well. You definitely need to keep it safe or high scores will add up quickly. One other thing they’ve done here is a major turf reduction. 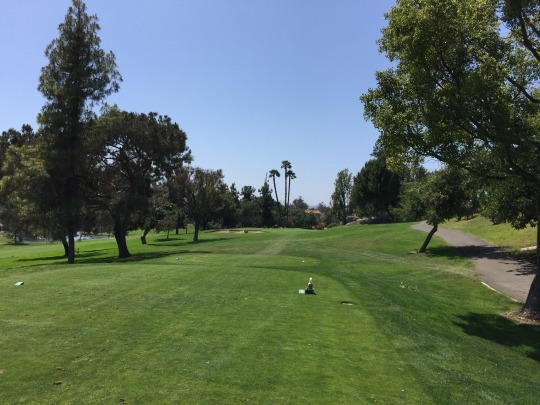 There were most of the “non-essential” areas (just in front of tee boxes, around trees, etc.) where the grass was taken out and either hard-packed sand or beauty bark was laid down along with the planting of some native bushes for aesthetics. 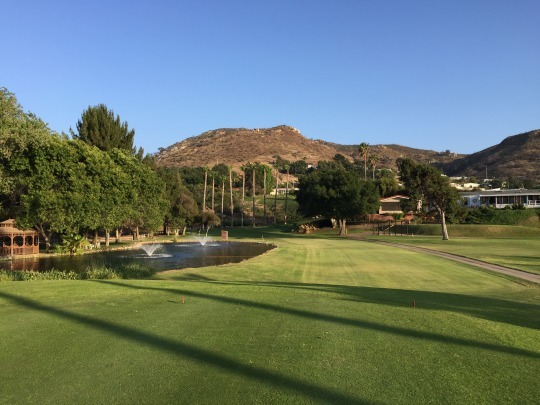 Then, the turf reduction also added a lot of challenge because they essentially expanded many of the water hazards and creeks by 10-20 yards. They cut out whatever rough was there before and replaced it with the hard-packed sand. 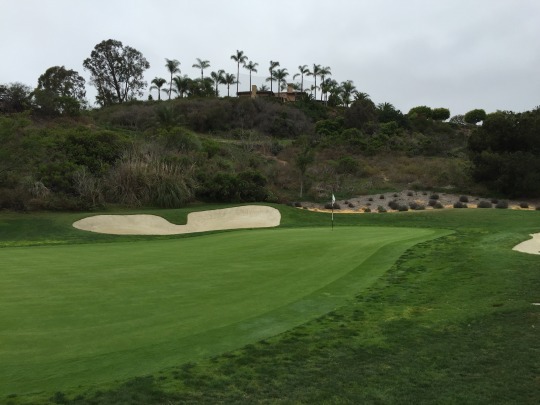 Many of these sections are also sloped toward the hazards, so basically any ball that finds the sandy stuff will likely end up in the hazard. 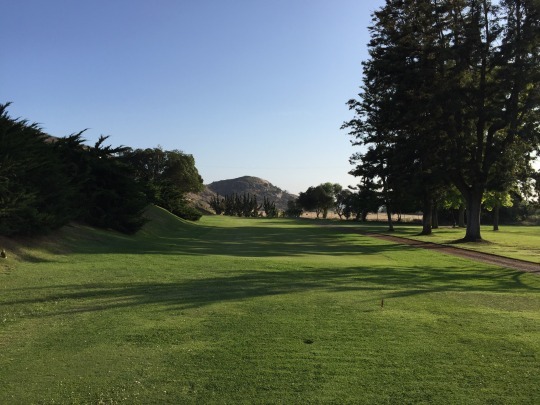 It really makes things tougher because the course was obviously designed to have rough in those areas that may stop your ball. Now, nothing’s going to slow it down and it’s a sure penalty stroke. Like I said, they essentially expanded the hazards. 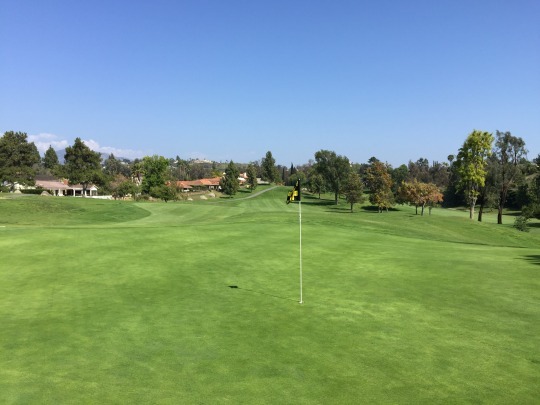 Overall, the course was in good shape. 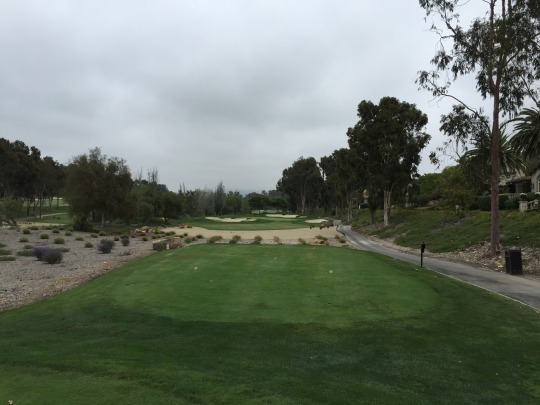 It played really nicely from tee to green. The fairways were great to hit from. There were some weak spots and repaired sections that were typically marked off as GUR. 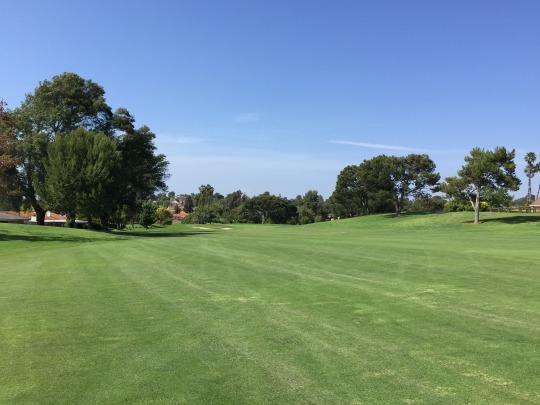 The rough was cut low and easy to play from. The greens were soft and rolling a medium speeds with a little morning moisture still on the surfaces. Our caddie seemed surprised at times at how slow some putts were because he’s used to them being lightning fast. 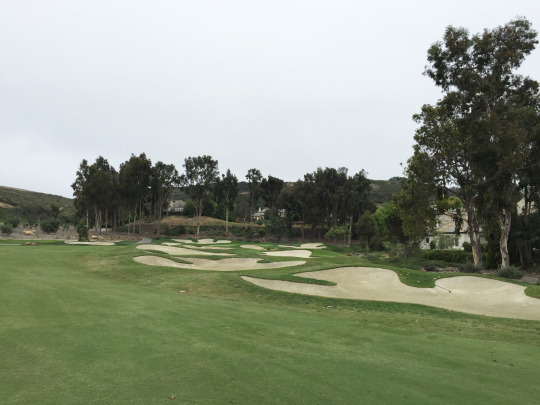 One gripe would be the bunkers. I was in a couple and thought they were both on the thin side. The sand was great, but just a bit too firm underneath. One other thing I noticed is that many of the bunkers had footprints all over the place. They have a small membership here that must feel cleaning up after themselves is not necessary. Members are obviously not required to play with forecaddies. I guess they expect the club maintenance to do it for them. Likewise, we fixed up plenty of stray ball marks on the greens and several greens had sandy footprints across the surfaces, so people also aren’t tapping the sand off their shoes after leaving all those footprints in the bunkers. It really is sad to see at such a nice club. Even if the players aren’t doing their part, maintenance probably should be taking care of it. Members do pay a hefty price for memberships and guest rates are also quite expensive, so somebody needs to get on it! Speaking of the price, that was running through my mind all round. 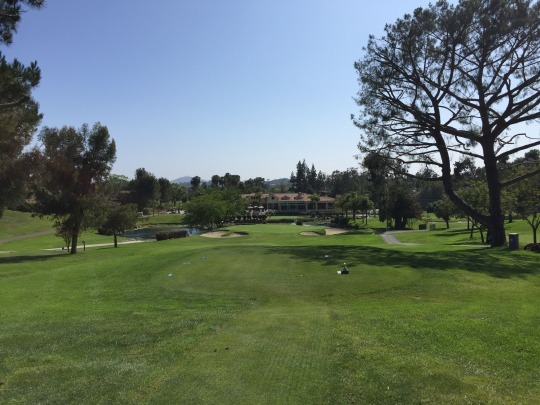 The SCGA outing was $230 per player, which is one of the most expensive ones they have all year. That doesn’t factor in the required forecaddie’s tip. This course is nice, but worth nowhere near that kind of fee. 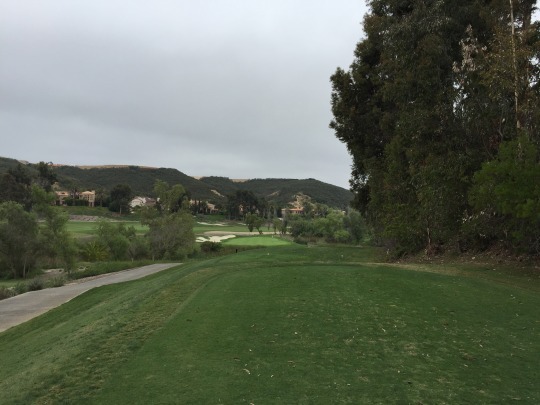 Considering I played every other Rancho Santa Fe course (almost all of which I would rank higher than Del Mar) for $150 or less, I couldn’t help but let the price tag at Del Mar bring me down a bit. 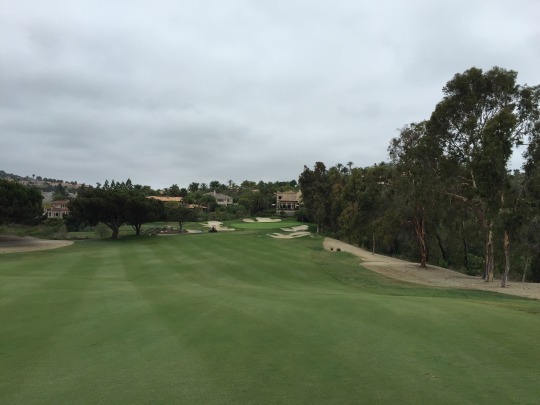 Del Mar is a very nice course with a really enjoyable layout and great private club facilities. 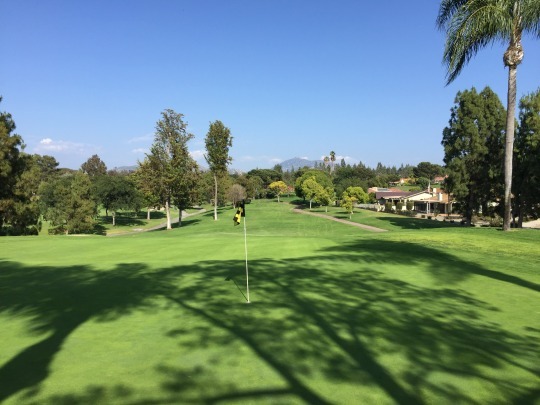 It’s worth checking out if you get a chance and money is not a factor to you, but otherwise save a little money and sign up for one of the other SCGA outings in Rancho Santa Fe. That’s my take on it. 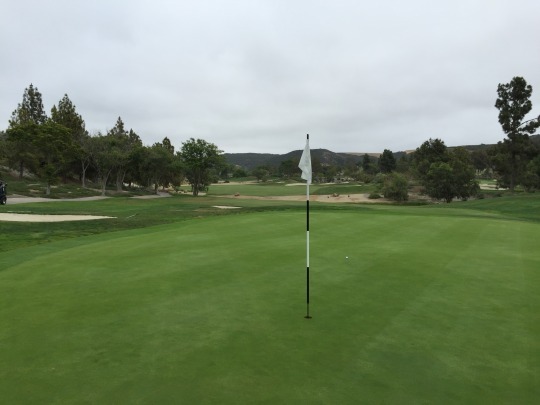 Another course collector friend of mine was also down in San Diego County that day and working on connections at some private clubs. 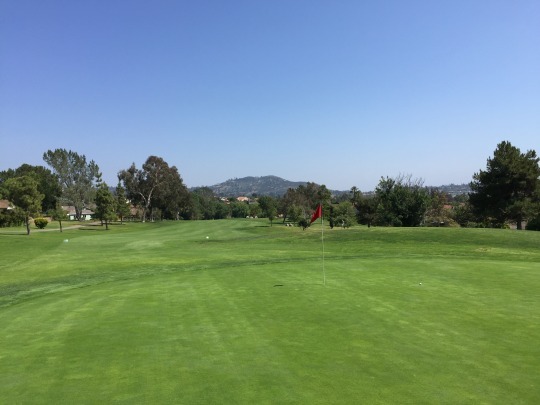 He was able to get us out at The Country Club of Rancho Bernardo, so I headed over there and we teed it up in the afternoon. It was nice as it took about halfway through the front nine before we caught any players ahead. Everybody was moving quickly and it turned out to be a little over three hours for the round. 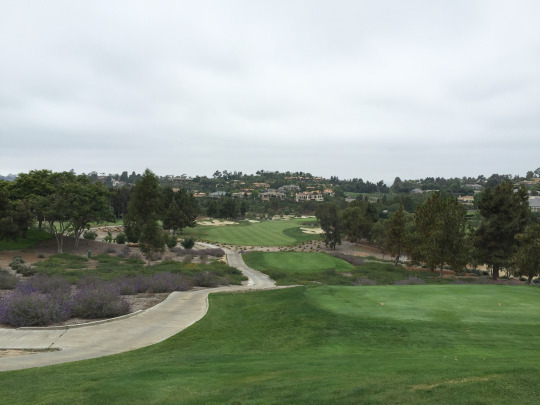 Obviously, I’ve seen parts of this course when heading to Rancho Bernardo Inn. The parking lots are right next to one another and they share the same driving range. They used to be sister courses as part of the same complex before one course went public with the resort and the other remained a private club. 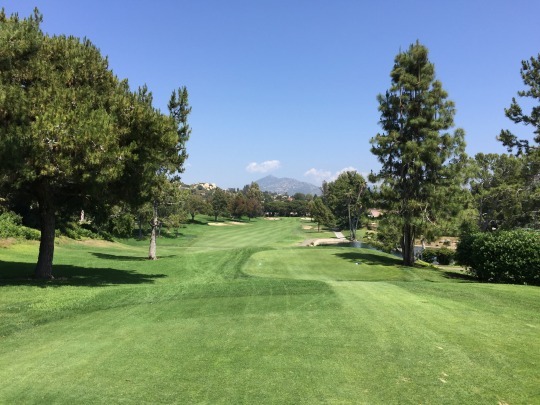 So naturally, it’s easy to draw comparisons between the two courses because they utilize similar terrain and design elements. That said, I thought the Country Club course was far superior. A large part of that has to do with the conditioning. This place was in exceptional shape. The grass was lush and green throughout the course. 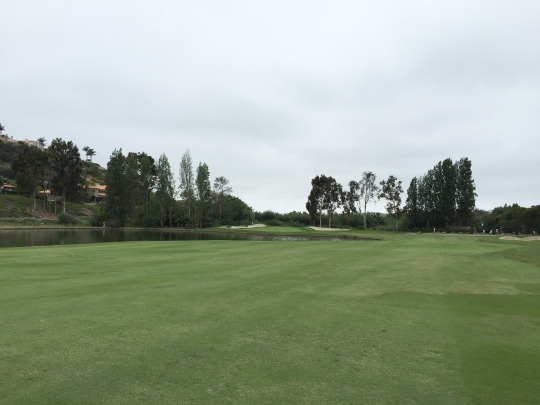 The fairways were amazing to hit from and the greens were fantastic, soft and receptive but rolling smooth on putts. I might say the layout at CCRB is probably more forgiving than the one at RBI, but both are designed to be fairly player-friendly. 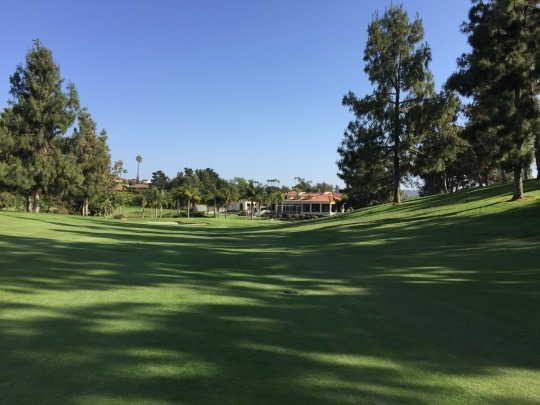 The Country Club course goes through the neighborhood, up and down some hills and through the trees. 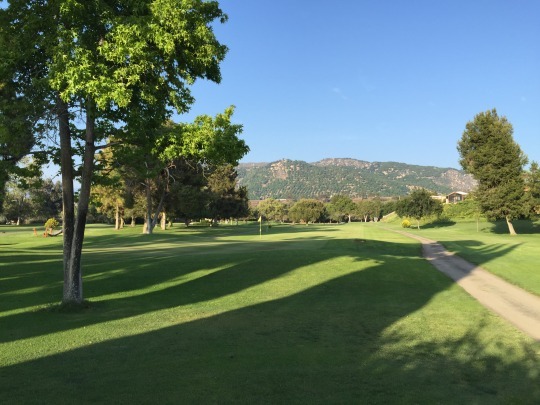 It’s just a nice pleasant golf experience that offers enough challenge to keep you interested, but also won’t beat you up too much. 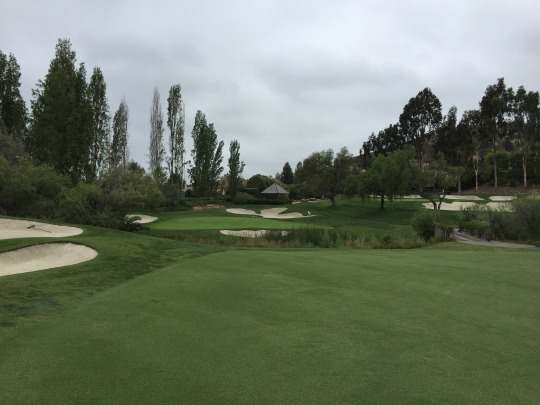 There isn’t anything overly distinctive about the layout, especially if you’ve played any of the nearby private or public courses that have their similarities. In fact, I might say CCRB is just a much nicer and full-length version of the executive Oaks North, which is also just across the street. Whatever the reasons, we really enjoyed our round here. 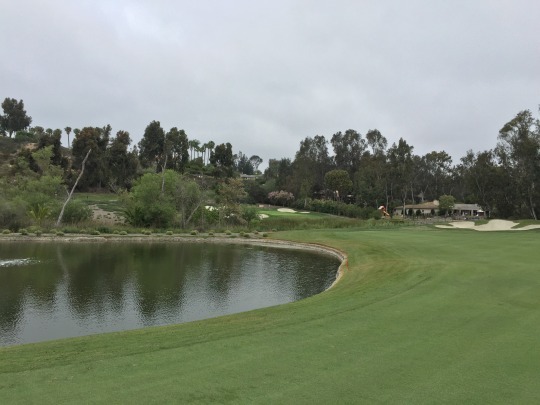 It helped that the sun was out in this area compared to the gloomy morning I had at Del Mar, so the pictures will really show off how nice this course was looking and playing. 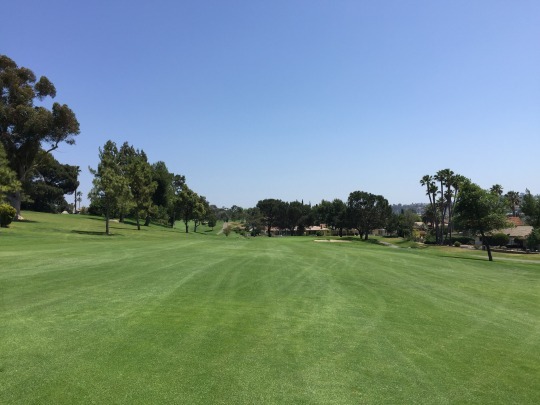 The Country Club of Rancho Bernardo probably isn’t a must-play as San Diego County private clubs go, but I’d put it at the top of that mid-range pack of courses. 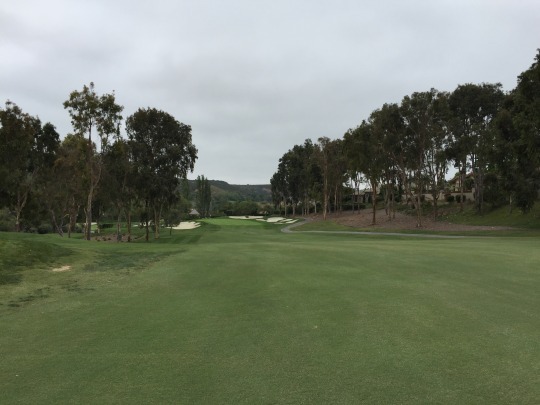 It’s odd because I may end up ranking the course below Del Mar when all is said and done, but I actually enjoyed my experience here much more and it was a way better value, too. This is probably the fourth time I’ve come out here to try and play. I once attempted to join up with members/residents heading out to the course, only to get denied at the last minute by one really unfriendly player. I’ve attempted to talk to the office, pitch my blog and try to work every angle I could. No luck. The only way seemed to be finding a member that would allow me to play with them. 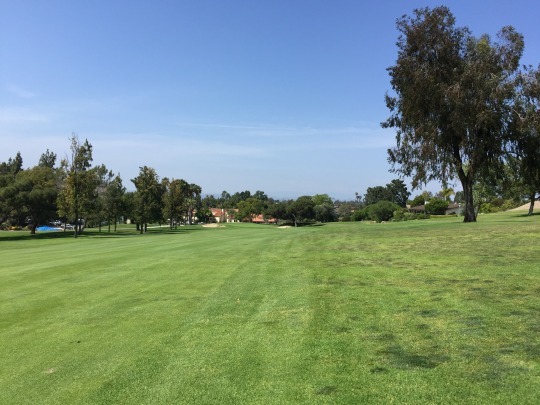 It was pretty dead out there, but I just so happened to run into someone and they let me join them for a quick nine holes. 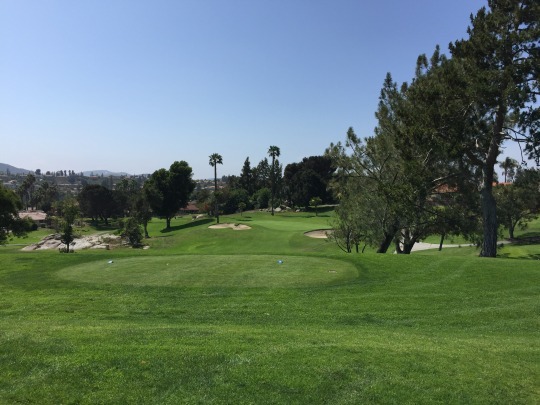 It’s just a 9-hole par-27 course, so it was an easy one to get around. 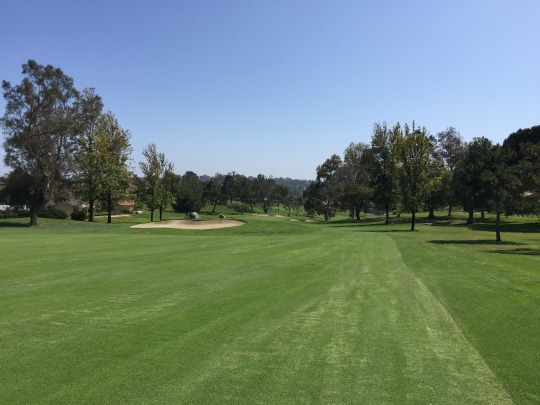 Rancho Monserate is a senior community that clearly likes to keep to itself. 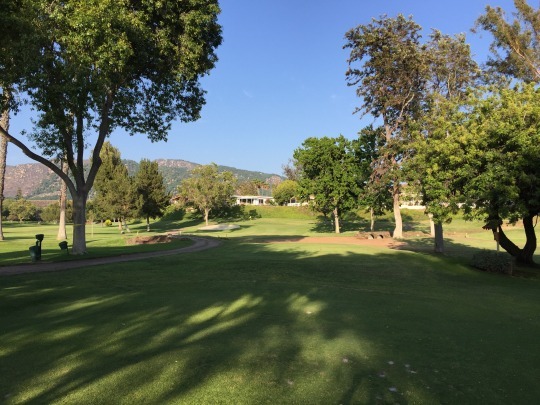 I do know all homeowners here own part of the course, as well, which is why they are kind of protective of it and don’t allow unaccompanied guest to play. 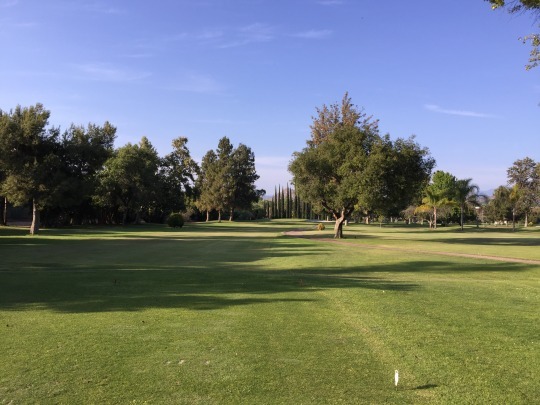 The course itself is pretty simple, but it was actually better than I expected. 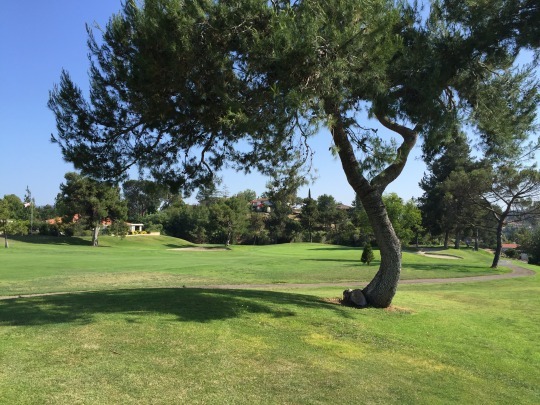 It’s kind of a nice little setting with tree-lined fairways and some pretty background views. The course is pretty flat as it goes back and forth. 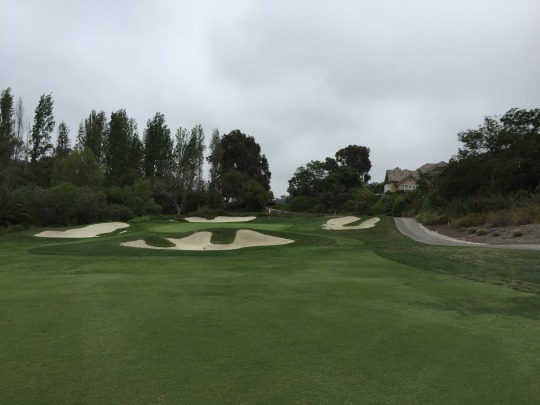 The holes range from 110 yards up to 190. The greens are small and simple. It’s just a solid little par-3 track. The conditions were also surprisingly nice. Everything was quite green. 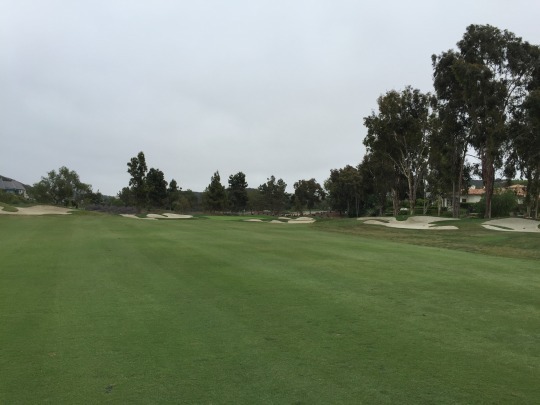 The tee boxes and “fairways/rough” had good grass coverage and the greens were good. They were rather firm and hard to hold, which was frustrating on a short course, but still rolled pretty well on putts. There isn’t much more to say about Rancho Monserate. I’m just kind of glad to have this monkey off my back and check another course off the list!